Fried chicken is the ultimate comfort food. The only problem? All that grease and, well, frying. 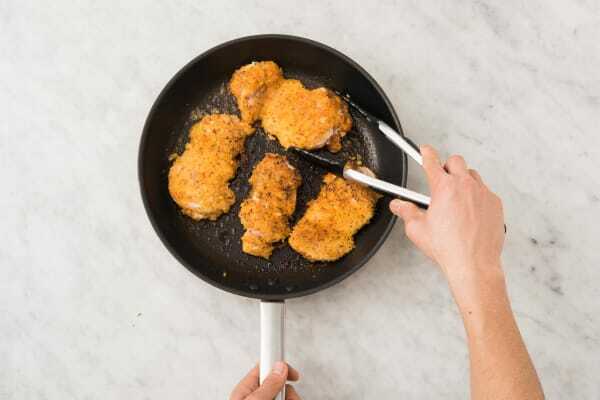 Luckily, our chefs found a way around this by coating chicken thighs with panko breadcrumbs and sour cream. 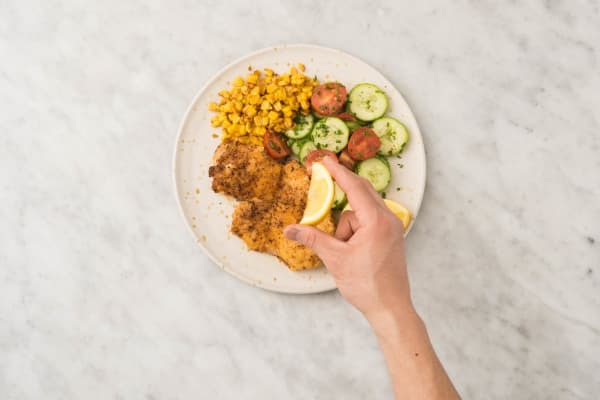 The combination of this richly flavored cut of meat and a super-easy breading technique reproduces the impeccable crispiness of the Southern classic without the gallons of oil. Wash and dry all produce. Adjust rack to middle position and preheat oven to 400 degrees. 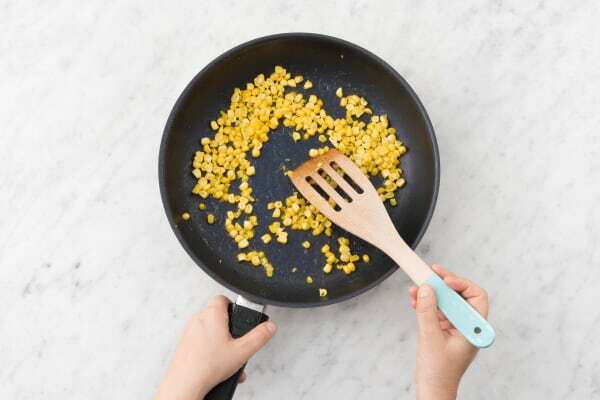 Cut corn kernels from cob. Slice cucumbers into thin rounds. Halve tomatoes lengthwise. Thinly slice chives. Cut lemon into wedges. 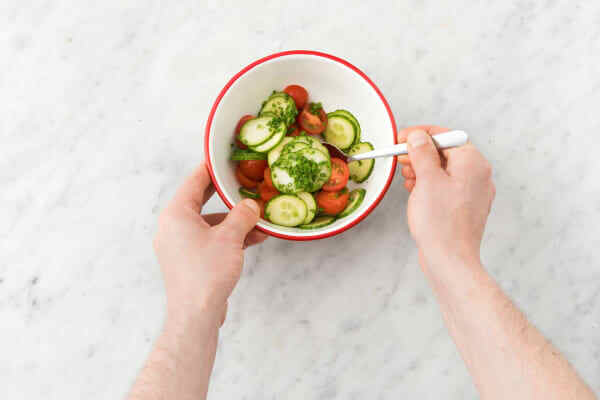 Place cucumbers, tomatoes, 1 TBSP chives, and a large drizzle of olive oil in a medium bowl and toss to combine. Season with salt and pepper. Set aside. Combine panko, fry seasoning, and a large pinch of salt and pepper in a large bowl. In another medium bowl, toss chicken with sour cream and a large pinch of salt and pepper, coating all over. Press chicken into panko mixture, coating all over in crumbs. Heat a large drizzle of olive oil in a large pan over medium-high heat (use an ovenproof pan if you have one). Add chicken and cook until crust is browned, 3-4 minutes per side. 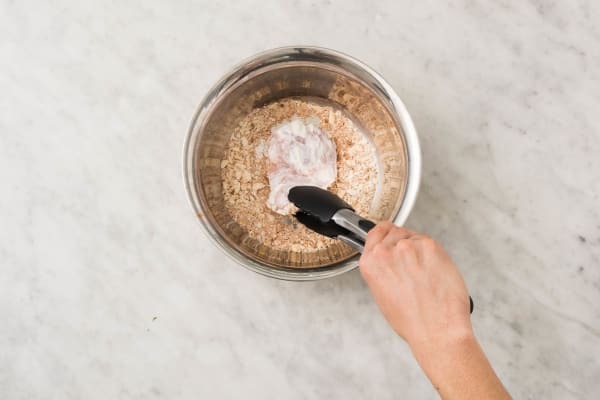 (TIP: Lower heat if crumbs brown too fast.) Transfer pan to oven and roast chicken until no longer pink in center, about 8 minutes (transfer chicken to a baking dish first if your pan isn’t ovenproof). Meanwhile, melt 1 TBSP butter in another large pan over medium heat. Add corn and cook, tossing, until kernels are a deep golden and butter is slightly browned and nutty-smelling. Season with salt and pepper. 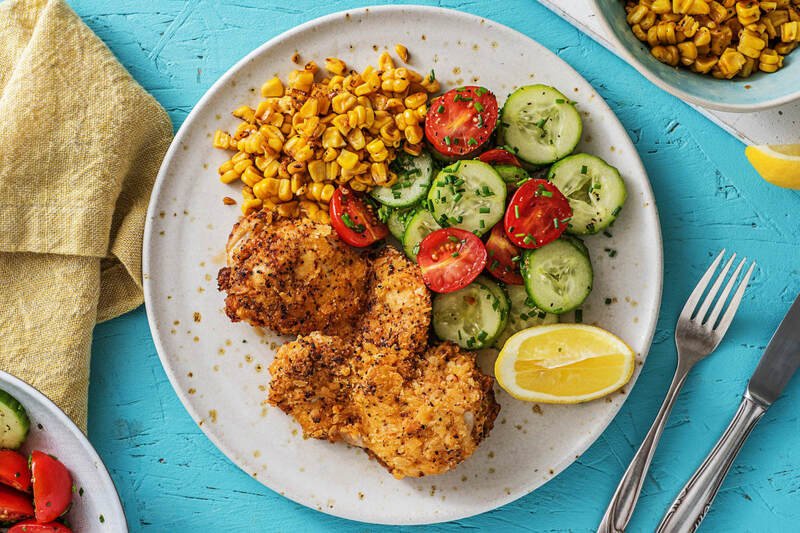 Divide corn, salad, and chicken between plates. Squeeze a bit of lemon over chicken. 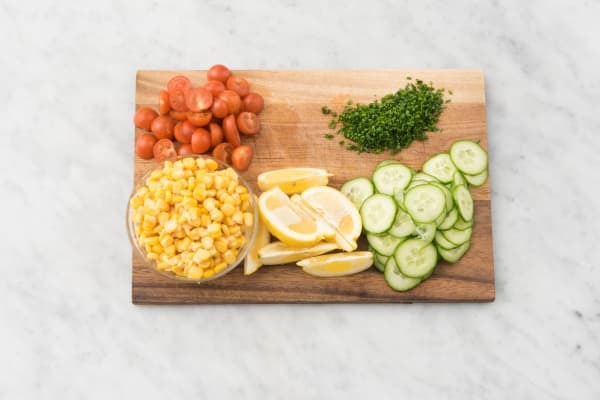 Garnish with remaining chives and serve with any remaining lemon on the side.